For my entire life, I have been bowlegged. I did not have rickets. I attribute the condition to riding horses and genetics. Many fine athletes, such as Gale Sayers and myself, are bowlegged. It gives us a better base for our superior balance than if we were, heaven forbid, knock-kneed. Tacklers find it much easier to tackle players whose knees collide anyway. One might be able to tackle a knock-kneed player with one hand, the knees being so close together and all. As everyone knows, Gale Sayers and I can only be tackled with great difficulty. An opposing player can barely reach around both knees at the same time. I don’t know if Gale likes to ride horses, but I do. Again, the advantage for a bowlegged rider is obvious. But enough about me and Gale. Let’s contemplate the legs of my lovely wife, Miss Sugar. I doubt that prior to this very day she ever desired to have bowed legs. For example, when she won the swimsuit event in the Miss Texas pageant, she did not have bowed legs and it is possible that she might not have won had she had bowed legs. Of course, that is speculation, but nevertheless, Sugar has never seemed envious of my legs. Today Sugar learned that her legs, as good as they might look, are not as functional as the bowed legs of me and Gale Sayers. I will tell you what happened today. As we were talking to a lady in the front yard of a suburban neighborhood, she told us to watch out because a loose dog was coming towards us. The large dog approached from the rear. Suddenly, he was in front of me, having passed between my legs. It was like going under a bridge. I do not recall feeling any contact. He just walked through. I had an adequate inseam as well as space between my knees. Then he tried the same thing with Sugar. It did not go so smoothly, The dog nearly knocked her down when he tried to go between her legs. He did not have room to maneuver once he tried to squeeze through. He got into the tight space and panicked. Sugar had to move forward with him to try to keep her balance because he was so tall that she was almost sitting on him. It was like she was riding him. They moved forward together for nearly ten feet. Finally, the dog was free again. Sugar kept her balance. The danger had passed. Sugar might be re-thinking which of us has better legs. The photo above was displayed for weeks at a gallery of photography. It was larger than life-size in the front window. These are Sugar’s actual legs. They served her well for modeling and girly things but, let’s face it, as Gale Sayers could tell you, they really would not work for a running back in the NFL. Just sayin’. I am the fella wearing a blue shirt and white hat. Note how a large dog could run between my legs. It was a steep hill. As the garbage truck moved down the street, of course it had to stop every couple of houses as the collectors went into the backyard of each house to empty garbage cans into their carriers to take the garbage back to the truck. Yes, it was long ago, before the plastic containers on wheels that residents now put on the sidewalk where they can be lifted to be dumped into the truck. It was a very hard job, with lots of walking and carrying and lifting. And moving the truck every couple houses. A childhood memory for me is the day the garbage truck rolled down the street, made a slight turn on the way down, and collided into the detached garage for the last house, the one on the corner, right before the intersection with the busy street, which is a good thing because it likely would have hit one or more cars, hurting or killing someone. Instead, our neighbor lost his garage. It was flattened. The garage was empty. The garbage truck had no driver or occupants. So no one was hurt despite tremendous property damage. We heard the crash while eating breakfast. Fortunately for me, I was wearing my pajamas that looked like a baseball uniform. Therefore, I went outside with confidence. No need to put on clothes. Everyone would think I was wearing a baseball uniform. As you can imagine, a crowd had gathered. I was a late arrival to the scene because we lived near the top of the hill. The people of the neighborhood gawked at the destruction. We guessed that the brakes of the truck were not properly set. Those of us who were experts at operating garbage trucks knew the cause. Then, while I was seemingly fitting into the crowd as one of the cool kids, Mary Perchau ruined it for me. Have you read the story about The Emperor’s New Clothes? I was in a role similar to that of the emperor. That darn Mary! I tried to explain that my garment could be used either as sleeping apparel or as sportswear. Obviously, it looked just like a baseball uniform. I was not yet old enough for Little League, but I was prepared. Mary was probably unaware of my destiny. Perhaps I had not yet told her that my Uncle Luke had been a Major League pitcher for the Cardinals. She did not understand that ballplayers such as myself did not dress like those merely in the general public, such as Mary herself, who undoubtedly lacked my intimate connection to Major League Baseball. The image above is of a puppy and cat meeting through the glass of a door between our kitchen and deck. The cat is a barn cat named Camo, who has brought us rabbits as big as himself, which he preys upon. We were concerned that he would see Gus, the puppy, as prey, so we have kept them apart. As you can see, they are curious about each other. Now I will tell you the rest of the story. After the featured picture was taken, I took Gus outside and carefully placed him in the dog pen we have. Of course, the cat can enter or leave the pen at will. When Camo came into the pen, I picked up the puppy and removed him from the pen, then put him on the grass in the yard. The cat left the pen to be with us. The cat, great hunter that he has proven to be, continued to study the awkward puppy. I stayed by the puppy, confident in my quickness so that I could grab the puppy if the cat threatened. The bumbling puppy left the safety of standing between my legs and recklessly bounded toward the cat before I could swoop him up. I feared that Gus was in harm’s way. It would be my fault if the cat scratched his eyes out or hurt Gus in any way. And, as Gus boldly ran right up to the cat, Camo did indeed defend himself by snarling and raising a claw-equipped paw. I did not blame Camo. Gus was the aggressor. Still, I wanted no harm to either pet. I wish I had a movie of what happened next. The cat decided that Gus is not a rabbit, albeit rabbit-sized. He recalled the proper world order, which is that dogs chase cats. Camo ran away from the ferocious puppy. Actually, the puppy seemed friendly and wanting to play, as he tries to do with everyone else in our family. He attacks Sadie and Beau. He attacks Sugar and me. He attacks tennis balls and stuffed toys and bones. Camo fled to a branch at an elevation just slightly beyond the reach of Gus, who barked at the cat in a scolding manner, challenging him to come down. Camo did not come down. Gus lost interest and followed me back to the house. Now he is sleeping. No doubt dreaming about battles won and to be won. It looks like it would be lots of fun to be a puppy. This one is a brave hero in his own mind, unaware that he looks more cute than tough. Two days ago, when I left for work at 6 a.m., it was snowing. Two hours later, my wife reported that we lost our electricity. When we lose electricity at the ranch, we also have no water because we have a well and the pump requires electricity. Of course, we were not the only folks experiencing an outage. It was widespread. Because it is late May, and we had 80 degree weather a few days ago, the snow was wet and heavy, and the wet snow broke many tree branches and, apparently, power lines and even poles. We have a backup generator. Unfortunately, it requires gasoline and pulling a cord to start it. Miss Sugar tried to start the generator but was unsuccessful. So, she wisely left before the snow got worse. She was smart to do that because shortly afterwards the highway was closed behind her. Sugar booked a bed and breakfast in town, where we stayed the past two nights. This morning we came home. The highway was open, our road was plowed, so we made it back okay. Our own unplowed lane was tough to navigate, but we made it to the house. We called some friends who live a couple miles away. The have been snowed in since Thursday. They endured the loss of electricity. They had groceries. We now have electricity. The pasture will be green from all the moisture. I shoveled off the steps and hot tub. No one feels sorry for someone with a hot tub. With the lack of moisture and high winds, there are frequent warnings about fire danger. So frequent are those warnings that one must be an idiot to light a fire in these conditions. So when I put trash in the burn barrel, I was aware that idiots should not do what I was about to do. As a special person who is not a member of the general public to which the frequent warnings were directed, I wisely checked the wind and determined that there was not much of it. Therefore, I took matters into my own hands and lit the tissue paper from the waste basket from the bathroom. As expected, the tissue paper ignited immediately. Having successfully started the fire within the safe confines of the burn barrel, I took the waste basket back into the house. There I went to the other bathroom and picked up another waste basket. Then I heard the loud pop. I looked out the window and saw that the grass next to the burn barrel was burning. An aerosol can had exploded and landed on the ground. It was a hairspray can which my wife had foolishly placed in the bathroom waste basket without warning me that I should not put it in the burn barrel. What was she thinking? Anyhoo, as a result of my wife’s utter carelessness, the grass fire spread quickly, beyond the reach of the hose I had heroically stretched to spray water as far as I could. So, with great embarrassment, I reluctantly called 911. “What is the nature of your emergency?” I was asked. “A grass fire,” I explained, deciding not to tell the dispatcher that it was all my wife’s fault. The investigators would see the hairspray bottle and determine that it was clearly not mine. Ergo, it could not be my fault. Fortunately for my wife, she was not home. I determined that I would simply tell those investigators that she was a fugitive and they would never be able to catch her. I would keep them busy while Miss Texas made her getaway. It is my job to protect her. She could count on me. In the meantime, before the firefighters arrived, and before the criminal investigators arrived, I bravely filled buckets with water and kept trying to stop the progress of the fire. While I was so engaged in that task, a nice man stopped by and pitched in. Eventually, the professionals arrived and got the fire under control. The nice deputy sheriff did not give me a citation because he recognized that it was “clearly an accident.” He did not even ask about the whereabouts of my wife. I imagined how grateful she would or should be for my success in clearing her name. While on this streak of righteousness, I decided to text my wife at work to inform her in advance that I had found a clever way to clear that old dry grass out of our yard and beyond. I decided that she would likely notice the 3 acres of black grass when she returned, so, like George Washington before me, I took responsibility for burning down the cherry tree. Actually, the fire stopped at the banks of the irrigation ditch and did not reach the trees on the other side. God protected us because the wind (the slight wind, I mean) blew the fire away from the house. The firemen protected us. And I protected Miss Texas. I am no snitch. I just hope that she learned her lesson. It could have really been bad. So, today Miss Texas, my personal trainer, suggested that I return to the swimming pool in order to prepare for success at next summer’s Senior Games aka Senior Olympics. A few years ago, I competed somewhat successfully in six swimming events at the national championships and the World Senior Games. No brag, just fact. My training was interrupted due to a number of reasons, including a trip to the hospital for a bum knee and a bicycle accident that injured my right shoulder. Rather than swim at the Olympic Training Center in Colorado Springs, Miss Texas and I decided to start our return to competition at the therapy pool at the Fort Collins Senior Center. Not surprisingly, the pool was full of old people. Clearly, we did not belong. Nevertheless, we tried to blend in. There is something wrong with me besides my knees and shoulder. My competitive drive is unhealthy. The old lady next to me did not realize it, but I saw her as a challenge and targeted her by giving her a headstart and then trying to pass her. She did not realize that she was in a race. But I did. Maybe tomorrow she will recognize just who she is dealing with. Or not. 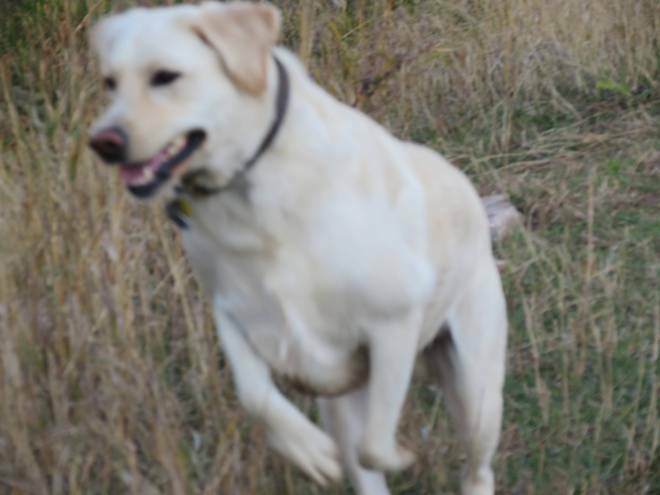 Some loyal readers have asked how Beau, our Yellow Labrador Retriever, is doing. I have some news to report. Beau, who has extraordinary self-esteem, and consequently expects that everyone, all creatures great and small, will like him, discovered, sadly, that is not true. It was not true when he met a Mastiff at a campground last week. As Miss Sugar told the story to me, the Mastiff, apparently irritated by Beau’s exuberant attitude, barked at him. Beau, delighted to have his presence acknowledged by another dog, pulled on the cable to which he was tied so hard that it broke. Beau happily ran to the campsite across the road, dragging the cable, expecting to play. When Beau arrived, the Mastiff, whom we shall call Cujo, knocked Beau onto his back and went for Beau’s jugular. Miss Sugar and Cujo’s owner watched in horror. Beau realized that Cujo was not playing nicely and managed to bite Cujo’s face. That move allowed Beau to get up and try to leave the adversarial situation. Unfortunately, Cujo was not finished. He bit Beau’s left hind leg. He bit all the way through the leg. Miss Sugar called for Beau to retreat. He did. It is rare for Beau to come when called. Cujo’s owner owner was embarrassed. She stated the obvious, “He does not get along with other animals. That is why we take him out for walks at 4:00 a.m.” It seems the dog has a history. Beau was not Cujo’s first victim. Sugar did not offer any sympathy. Sugar did take Beau to a vet she found in the area. (I was not there to help. I was at work, scheduled to join the family later.) The vet treated the puncture wounds from the bite and prescribed antibiotics. She said Beau might need a shunt to drain infection if that sets in. He had to wear a cone to keep him from licking his leg. When I arrived at the campsite, Beau was not the happy camper I am used to seeing. He was depressed. He was in pain. He did not want to walk on his swollen limb. He hated wearing the cone. We were sad to see Beau so very sad. I think part of his depression came from the realization that Cujo did not like him. That fact did not Beau’s worldview that everyone likes him. He seemed to be suffering from Post Traumatic Stress Disorder. But don’t worry, Beau fans, he has bounced back. He did not need a shunt. He no longer limps. The cone is off. He has re-captured his gift of enthusiasm. Warning: If you are a lover of bats, the following post contains disturbing material. An erratic flight pattern by something crosses the TV screen in the dark room. We know what it is. We have had this experience many times before. I turn on the lights in the room and we try to spot where the creature has landed. My wife, Sugar, is my spotter. She tells me to look at the third log from the top, right of the smoke detector. I grab my trusty Red Ryder BB gun and take aim. POW! The winged creature drops to the floor. The wings close around the body of the deceased. It is a goner. Another one bites the dust. Not everyone shoots BB guns inside one’s home. But I ain’t everyone. I am a special marksman living in a log home with high ceilings. We like bats flying around outside, presumably eating bugs. But inside? That’s where I draw the line.